Chevrolet and GMC have begun a top-to-bottom overhaul of their truck lineups, which include some of the highest-volume, most profitable vehicles that GM sells. The truck onslaught follows a three-year period during which Chevy's car lineup has been overhauled with well-received entries such as the Sonic subcompact and Cruze diesel. But more cars are on the way, too: The Corvette Stingray, Chevy SS performance sedan and a re-engineered Malibu are slated for launches in the second half of the year. Several models of the Chevy Silverado and GMC Sierra 1500 will arrive at dealerships later this summer and fall, joining the 5.3-liter V-8 crew cabs that began shipping in late May. After that, the redesigned heavy-duty 2500 and 3500 will land in early 2014. Those will be followed by the next-generation Tahoe, Suburban, Yukon and Yukon XL SUVs, in spring of 2014, and the redesigned Colorado and Canyon mid-sized pickups by late next year. Here are highlights for Chevrolet and GMC's 2014-16 models. Spark: An electric version of the minicar went on sale last month in California and Oregon for the 2014 model year. The two states, with their tough emissions standards, tax credits for electric cars and green-minded cities, are often the first to get new electric vehicles. Sonic: The subcompact debuted as the redesigned Aveo replacement in fall 2011. It would be due for a freshening or a re-engineering for the 2015 model year. Cruze: A redesign had been expected in late 2014 or early 2015, but Reuters reported last week that the launch has been pushed back one year. GM's best-selling car globally will be among the first vehicles launched on the newest version of its global compact vehicle platform, named Delta. A late 2014 launch would have been a speedy redesign for the Cruze - about four and a half years - since the U.S. model's debut. The 1.8-liter base engine likely will be replaced by a new 1.5-liter. Following the launch of the redesign, the addition of a Cruze hatchback or a coupe is a possibility. Volt: No major changes are expected to the plug-in hybrid before a redesign arrives in late 2015 as a 2016 model. GM aims to shave several thousand dollars in cost from the next-generation Volt, which currently stickers for nearly $40,000. GM probably will downsize the 1.4-liter, four-cylinder engine to improve its efficiency in range-extension mode. Possibilities include a 1.0-liter or 1.2-liter three-cylinder engine. Media reports have suggested that the next-gen Volt will get a dedicated lightweight platform. Cost constraints make that unlikely; expect it to remain on the same platform as the Cruze and Buick Verano, the enhanced Delta architecture. But the platform likely will be modified to maximize weight savings and wring out more electric range. Malibu: A rapid re-engineering of the mid-sized sedan, which was redesigned barely a year ago, will hit showrooms this fall. The 2014 Malibu gets an improved 2.5-liter engine with a stop-start system, a new front end with a bolder grille, a roomier rear seat and revised center console. Within a year or two, GM might add a turbocharged 1.5-liter engine to the Malibu's engine lineup to boost its competitiveness on fuel economy. Impala: The large sedan was redesigned for the 2014 model year as a head-turner aimed at boosting retail sales. The fleet-only version of the outgoing Impala, dubbed "Impala Limited," will be produced at least through the 2014 model year. Chevrolet SS: The Australia-built rear-wheel-drive performance sedan will hit showrooms late this year as a 2014 model, with a 6.2-liter V-8 engine that produces 415 hp. The car is built on GM's rwd Zeta platform, an underpinning on which the Chevy Camaro also rides. Production of a next-generation SS likely will shift to the United States in 2015 or 2016 with a move to GM's new Alpha platform, which underpins the Cadillac ATS and will host the next-gen Camaro. Corvette: The 2014 Corvette Stingray should start arriving in showrooms in September. The convertible should go on sale by year end. Chevrolet will bring back the Camaro Z/28, which goes on sale early next year. Camaro: The muscle car gets freshened for the 2014 model year with a revised front fascia, larger grille and racing-inspired seats. But the big news is the return of the Z/28 model, which arrives in showrooms early next year with a V-8 engine that packs 500 hp and 470 pounds-feet of torque. 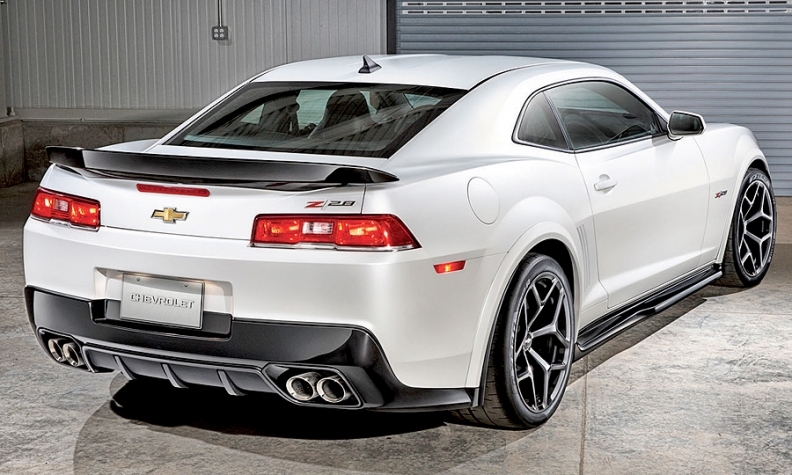 The sixth-generation Camaro will shed considerable weight when it moves to the Alpha platform in late 2015 as a 2016 model. GM CEO Dan Akerson has targeted an average curb weight reduction of 15 percent by the 2016 model year across GM's lineup, in part through broader use of advanced material such as aluminum, stronger steel and carbon fiber. The engine lineup is expected to expand to include the same 2.0-liter turbocharged engine in the ATS, possibly as the base engine. The naturally aspirated 3.6-liter should remain, joined by a version of the new 5.2-liter V-8 that does service in GM's trucks. GM said it is moving production of the redesigned Camaro from Oshawa, Ontario, to its Lansing Grand River Assembly Plant in Michigan, home of the ATS. Baby Camaro? GM North America President Mark Reuss said in May that his top priority for Chevy's lineup is a less expensive rwd sports car that would compete with the Scion FR-S and Subaru BRZ. No formal plans have been approved. GM could choose from a number of four-cylinder engines: a naturally aspirated 2.5-liter, a turbo 1.6-liter or a turbo 2.0-liter. Equinox/Terrain: The redesign of the popular mid-sized crossovers is scheduled to arrive in early 2015, as a 2015 or 2016 model. It will be slightly smaller - today the Equinox and Terrain are among the largest mid-sized crossovers - and will shed significant mass as it moves to GM's new global crossover architecture, a modified version of its Delta compact platform. The base engine will be GM's new 2.5-liter, four-cylinder engine, an upgrade from the current 2.4-liter. A plug-in hybrid is likely, as well as an eAssist mild hybrid model. For now, GM is expected to continue to offer the 3.6-liter V-6. Traverse/Acadia: The big crossovers will be redesigned for the 2016 model year. They are likely to keep the base 3.6-liter V-6 engine. They eventually will get the front-wheel-drive nine-speed transmission that GM is developing jointly with Ford Motor Co., but it probably won't be available until 2017. Tahoe/Yukon and Suburban/Yukon XL: The big SUVs will get an abbreviated 2014 model year before redesigned versions arrive in showrooms by spring of 2014 as 2015 models. Built on the same body-on-frame platform as the full-sized pickups, the SUVs will get GM's new 5.3-liter V-8 engine. They also eventually will get eight-speed transmissions. The interiors will be vastly improved from the outgoing model, with the addition of Chevy's MyLink and GMC IntelliLink infotainment systems and a new fold-flat third row. Colorado/Canyon: The redesign of GM's mid-sized pickup will be larger and sport bolder styling when it arrives in late 2014 as a 2015 model. The engine lineup likely will include a 2.5-liter, four-cylinder as the base and the 4.3-liter V-6 offered on the 2014 Silverado. A diesel isn't expected, at least not at launch. Some industry forecasters say GM will use the 2.0-liter diesel engine from the recently launched Cruze, or the 2.8-liter diesel that does service in the Colorado in Asia. But that would drive the price up into Silverado territory. Silverado/Sierra 1500: Crew cab versions of the redesigned 2014 pickup began rolling out in late May. They will be followed later this summer with a regular cab and a double cab, which replaced the extended cab model. GM says the 5.3-liter V-8 in the new 2014 Silverado/Sierra gets better fuel economy than the Ford F-150. A 4.3-liter V-6 also rolls out this summer, with a 6.2-liter V-8 to arrive in the fall. 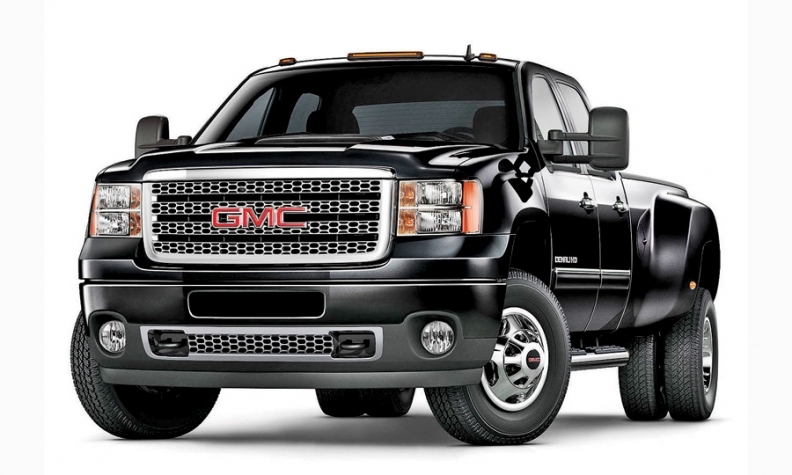 GM execs vow to make regular enhancements to the truck throughout its life cycle. The most notable likely will be an eight-speed transmission and the addition of a diesel engine. Both could come in 2015 in time for the 2016 model year. V-8 diesel - when they arrive in showrooms at the start of 2014. Expect the same exterior and interior styling as the recently launched 1500.